So, I've been volunteering to help with cooling the sushi rice for the Obon Festival for a few years now. I've been adopted by my best friend's family as the "4th Sister" and get included in family events like Sunday hikes, and the family reunion picnic in May. It seems only fair that I join in the more mundane activities as well. The rice is cooked in huge quantities, and seasoned in the kitchen. Then it is brought out to the cooling tables, where it is spread out on netting, over wire racks, with fans blowing on either side of the table. The job of the volunteers is to spread out the huge mass of cooked rice, so that it cools as quickly as possible. We break up big clumps, but gently so as not to smash the individual grains, which would just turn them into rice paste goo. For about 10-15 minutes, we keep turning the rice over, so it does not stick to the netting. Once it is totally cooled, it gets added to a huge mound of cooled sushi rice on 2 long tables, and covered with damp cloths. If any of the rice is not completely cooled, it will mold overnight, ruining the entire pile. This happened one time a few years ago, and all the rice had to be thrown away, wasting the efforts of all the volunteers the night before. 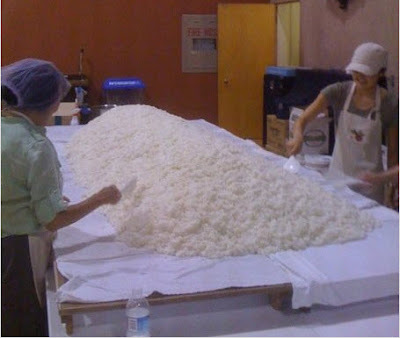 This huge pile of rice(photo) rests overnight, until the ladies who make the actual sushi, come in at 5:00am. They roll the sushi to sell at the festival that day. This is a fundraiser for the San Jose Buddhist Church's women's group and elder group. Actually, the entire festival is a fundraiser, of course, with every church group involved in different activities. There are girl scouts, boy scouts, the basketball team, taiko club, etc. Both nights were cool, so we actually got done around midnight. In years past, we've finished up at 2:00am. Some of the others had started around 6--I got there at 8pm. The upside is that they cook us a midnight meal. Curry stew Friday night, and teriyaki sausages on Saturday night. You get pretty hungry flipping steamed rice for 5 hours! Maggie would love it. She loves sushi asome sashimi. Me, on the other hand, would rather a burger or steak. I tried a California Roll and a Cucumber Roll once...did NOT like either of them. Its nice that you volunteer for such a good cause.